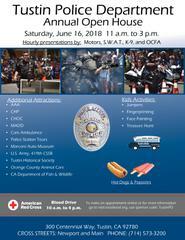 On Saturday, June 16, 2018 from 11 a.m. to 3 p.m. the Tustin Police Department will hold its 22nd Annual Open House event (300 Centennial Way, Tustin). It’s free and lots of fun for the entire family! 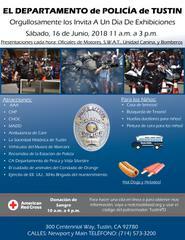 There will be games, food, and demonstrations by motor, canine, S.W.A.T., and the fire department. Visit with various organizations such as the California Department of Fish & Wildlife, the Tustin Historical Society, the U.S. Army, and many more. Take a tour of the department, visit our various police units and our personnel. Here’s a chance to learn more about the people who protect our City. The kids can go on a Treasure Hunt, play in the bounce houses, and enjoy free face painting. A free hot dog lunch will also be available (while supplies last). Everyone is invited to attend this event, so mark your calendar!